San Diego Zoo Wants You! Wants you to visit that is. I recently had a chance to visit the San Diego Zoo for the first time in about 22 years. Not surprisingly, a lot has changed. My husband and I along with our two toddlers (and an entourage that included my parents and my brother and his wife) spent an whopping 7 hours at the zoo – and no, we still didn’t see the whole thing. The world-renowned San Diego Zoo is huge, amazing and well worth a visit if you’re heading to the San Diego area this summer. We have a local zoo that we frequent and the kids adore, but the sheer size of the San Diego Zoo as well as the number and type of animals they have is awe-inspiring. I was also incredibly impressed with how close you get to the animals. True, many of the animals prefer to nap or hide, but when they are out, you get a great view. • Giraffes in the Urban Jungle – majestic and so close! • Seeing California’s animals – past and present – at the new Elephant Odyssey – it’s at the faaaar side of the zoo, but totally worth it. Time it right and you can be within feet of the elephants as the trainers give demonstrations and answer questions around the backside of the elephant habitat. 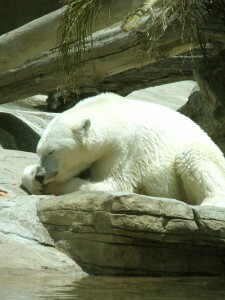 • Polar Bear Plunge – polar bears in San Diego? It’s true and incredible to see in person. Plus the viewing area allows you to watch them lounge on the rocks chomping on veggies and swim right past you in their private pool. 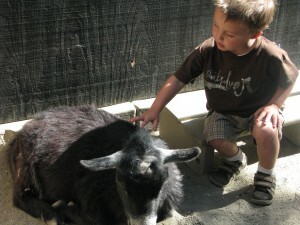 • Children’s Zoo – with more than 30 exhibits geared for younger zoo go-ers (but fun for all ages) you can pet a goat, watched a naked mole rat, see a bread house and its mouse guests, learn about composting, or climb, jump and run on the newly opened Fisher Price Discovery Playground. 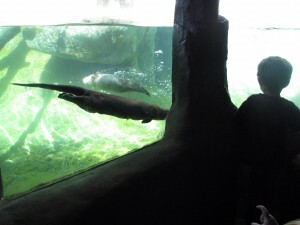 Zoo Tips – Thinking about heading to the San Diego Zoo this summer? Use our tips and tricks to make the most of your experience. • Plan a route. Look at the map online or pick up a free one when you get to the park and plan out a route to take through the park. There are some one-way paths and up-only escalators (yes, escalators in the zoo – and it will cost you to use them) so especially if you have limited time or definitely want to see some of your favorite animal friends, make a plan. From our experience, the map made distances look longer than they actually were. • Buy the ridiculous memento cup. Vendors and restaurants throughout the zoo sell a 24-oz cup with some huge animal head on it and a straw (ours was a a tiger). It costs about $10 filled with any fountain drink you desire, but in addition you get FREE refills at most vendors in the park, all day long. Especially if you don’t mind sharing drinks, this is a great deal. • The bus is your friend. The Best Value ticket includes unlimited use of the Guided Bus Tour, Express Bus, and Skyfari Aerial Tram. You can hop on the 35-minute narrated bus tour that covers about 75% of the zoo to get a sense of which areas you want to come back to visit. Or like we chose to do, walk as much as you can to start and then hop on the tour bus to rest your legs and learn some fun facts from the tour guides. The Express Bus has no narration, but drops you quickly between various stops around the park. • Bring snacks and refreshments, but know that the park food is decent and only moderately over-priced. There are 10 restaurants in the zoo with dozens of other snack stands scattered throughout the park. With two toddlers in tow, we were packed with snacks, but enjoyed a delicious and not-too-pricey lunch at the Canyon Cafe. • Ride the SkyFari Aerial Tram. As if you had to be convinced. There is something magical that happens when kids get that mix of fear and excitement of being that high and cruising over a myriad of animals. Tickets are $4 each way, but unlimited rides are included in the Best Value ticket. So what are you waiting for? 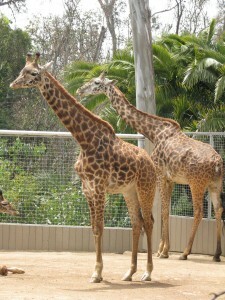 Visit the San Diego Zoo this summer (or any time this year) – you and your kids will not be disappointed! Excellent work by the writer, spelling, grammar and a great story! Thanks! The heart of your writing whilst sounding reasonable at first, did not work properly with me personally after some time. Somewhere throughout the paragraphs you actually were able to make me a believer unfortunately only for a very short while. I still have got a problem with your leaps in assumptions and one might do nicely to fill in those gaps. If you can accomplish that, I could definitely be amazed.